This is something anyone can make. There’s no reason why you can’t roast a flaming red pepper. There’s no need to buy them in a little jar – honestly it’s easy! Don’t be swayed by the fancy packaging – if there’s a picture of an old lady on the jar I can guarantee she’ll have done the same with the pepper as you’ll do. Char grill the capsicums by either, placing directly over a gas flame until the whole surface is black. Then place in a plastic bag for 5 minutes. Slide off the skins, remove the seeds and slice the flesh into thin slices. Or, preheat the oven to 220ºC, half each capsicum and bake in the oven for 30-35 minutes until the skin is charred. Remove and place in a plastic bag for 5 minutes then remove the skins and seeds and slice the flesh thinly. Let the capsicums completely cool then combine with the olive oil, lemon juice and white wine vinegar. 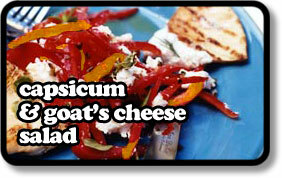 Season with salt & pepper then gently crumble the goat’s cheese over and stir in lightly. Great as a part of a mezze selection, but also good with fish or chicken.